I admit that I frequently try to convert my friends… sometimes they politely change the subject, sometimes they quickly shut me down, but every once in awhile, they’ll take me up on my challenge to get out of their comfort zone. And yes, on a few occasions I’ve tricked them into it. I’m not talking about inviting friends to church (though it’s an open invite and we’d love to have you join us!). I’m talking about trying a new twist on an old favorite. In this case, it’s trading in your grandmother’s decades-old meatloaf recipe for an updated, probably healthier version with a delicious twist. 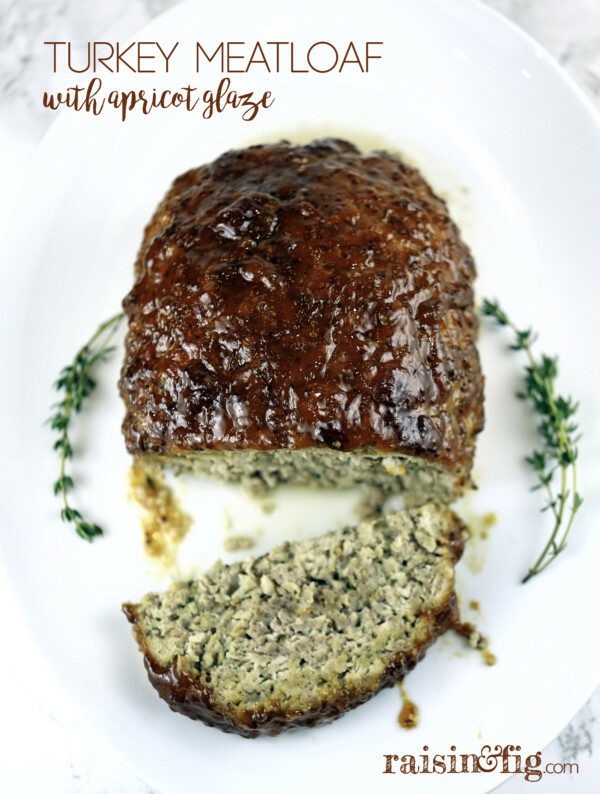 This is Turkey Meatloaf with Apricot Glaze. And it’s fantastic. I’d been making various versions of turkey meatloaf for awhile, but it wasn’t winning any converts. Then an issue of Cook’s Illustrated arrived that changed everything. Recently, they did a multi-page story on getting turkey meatloaf right – and by “right” I mean incredibly flavorful, hearty and not dry. Husband immediately inducted Turkey Meatloaf with Apricot Glaze into his personal entreé Hall of Fame. I don’t hesitate to serve it for company, it’s that good! And converts? Even one of my most “particular” friends goes so far as to request this when he visits. I’d recommend doubling the recipe and freezing one of the loaves. Mix and shape, but don’t glaze and bake until you’re going to serve it. Thaw overnight in the refrigerator. FOR THE MEATLOAF: Adjust oven rack to upper-middle position and heat oven to 350 degrees. Line wire rack with aluminum foil and set in rimmed baking sheet. Melt butter in 10-inch skillet over low heat. Stir baking soda into melted butter. Add onion and ¼ teaspoon salt, increase heat to medium, and cook, stirring frequently, until onion is softened and beginning to brown, 3 to 4 minutes. Add garlic and thyme and cook until fragrant, about 1 minute. Stir in Worcestershire and continue to cook until slightly reduced, about 1 minute longer. Transfer onion mixture to large bowl and set aside. Combine oats, cornstarch, ¾ teaspoon salt, and ½ teaspoon pepper in second bowl. FOR THE GLAZE: Microwave apricot preserves until hot and fluid, about 30 seconds. Strain preserves through fine-mesh strainer into bowl; discard solids. Stir in mustard, ketchup, and salt; set aside. Stir egg yolks and mustard into cooled onion mixture until well combined. 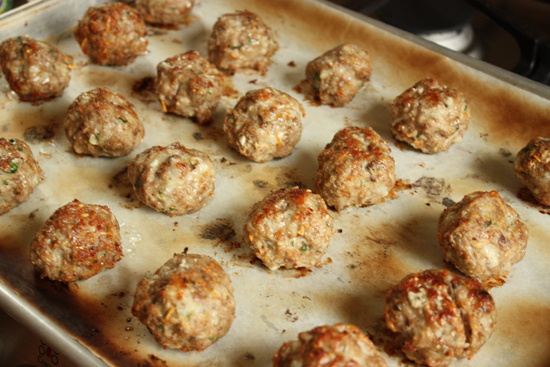 Add turkey, Parmesan, parsley, and oat mixture; using your hands, mix until well combined. Transfer turkey mixture to center of prepared rack. Using your wet hands, shape into 9 by 5-inch loaf. Using pastry brush, spread half of glaze evenly over top and sides of meatloaf. Bake meatloaf for 40 minutes. Brush remaining glaze onto top and sides of meatloaf and continue to bake until meatloaf registers 160 degrees, 35 to 40 minutes longer. Let meatloaf cool for 20 minutes before slicing and serving. Freezes well. Mix and shape, then wrap tightly and freeze. Thaw overnight in fridge, then glaze and bake as instructed. Can’t wait to try it. Glaze is the same as my mom’s except you substitute apricot preserves for her brown sugar! This was delicious. Thanks. I halved the recipe (and omitted parsley and cornstarch since I had neither on hand) and made four individual serving-sized mini-loaves, which took 35 minutes at 350. Big hit at my house. Love the idea of mini-loaves!!! I’m doing that next time!